That news is like a week old. Well, the NFL did officially suspend Jameis Winston. Brent Musberger to replace Greg Papa as radio voice of the Oakland Raiders starting with the 2018 season? My take since I'm from the San Francisco Bay Area? I have to listen to Greg on his side of this rumored axing. However, I think it's a sucker punch from behind to both Papa and one of the Raiders' legendary coaches who is his sidekick for 21 years in Tom Flores from Mark Davis if it's genuinely official. Memo to Mark Davis: I don't care if you want to phase out all of Al Davis' Raiders legacy here in Oakland, but give Papa and Flores a chance to be the voices of the Raiders before you fully move to Las Vegas after your stadium is completed. Okay folks, here are my 2018 NFL regular season predictions. I defy you to find a better stat this season. I saw one yesterday, which I can not find now. 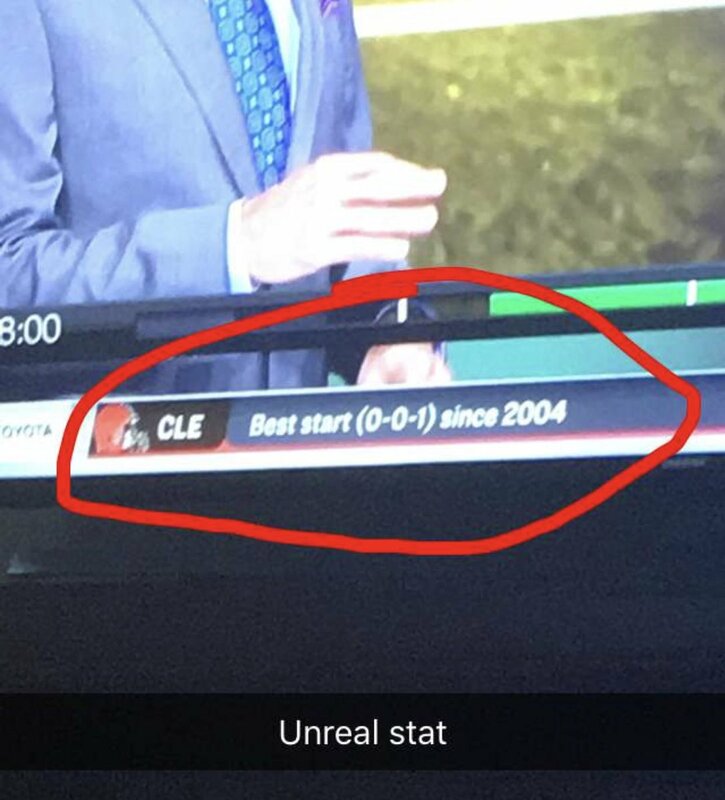 Teams with a +5 turnover ratio in a game(which Cleveland had yesterday) are something like 162-4-1...Cleveland accounts for 2 of those loses, and now the tie. Last edited by DrNick; 09-10-18 at 09:59 AM. With a 24-23 win and a 29-29 tie, Green Bay became the first team to play two consecutive ties or consecutive games that were a tie and decided by 1 on consecutive weeks since Kansas City on September 25, 1988; October 2, 1988; and October 9, 1988. In between Green Bay and Kansas City, Cincinnati did that on October 30, 2016 and November 14, 2016 with a bye in between. Vontae Davis retires mid game..probably realized..wow the Bills stink. It took him until the middle of week 2 to realize that? Well he was inactive for week 1. So, took a half to realize he just cant do it anymore. But hey, making the active roster out of preseason(which shocked alot of people) got him $5 million guaranteed. A Jags-Rams Superbowl would be a lot of fun to watch. Wow, did not know that. Good for him for getting one last payday. LOL, he retired at half time! That is an all time stunt, "I QUIT ****s, see ya!!!" It would be great if it went down like this. Defensive backs coach: "Davis...I want you to play more press coverage"
Vontae Davis: "Yea coach, about that....my Uber is here"
"How 'bout you press cover deez nuts, coach. Vontae, out!" Pretty sure Jimmy G tore his ACL trying to get a few extra yards yesterday instead of running out of bounds. Huge loss for the 49ers. Meanwhile Patrick Mahomes is off to the best start for a QB in league history. Through 3 games he has 13TD and 0 INT. His throw yesterday was probably the most athletic and amazing TD pass of the young season so far for any QB. It really feels like one of those seasons where nobody is good and nobody is bad..outside of a couple of wild exceptions.